EKN: Tom, thank you for taking the time to talk to us with the SpringNationals looming on the horizon. We’re sure that you’ll all running at 100% capacity in the SKUSA head office right now, but this is obviously a key opportunity to discuss the launch of IAME USA, and specifically, your role as the West Coast distributor for the program. This is not an insignificant announcement, by any means. Tom Kutscher: Thank you for the chance to chat about this new IAME program, and you’re correct, we’re flat out here right now. This year’s SpringNationals will be our largest Pro Tour race ever, other than the SuperNationals. We’re expecting 250 drivers in Dallas next weekend, and it looks like S2, S4, TaG Senior and TaG Cadet will max out at 44 entries. That’s super exciting for us. And to begin answering your question, the launch of IAME USA West is really exciting for me as well. It has been a great deal of work, but it’s all worth it, as I know that we’re doing something special for the sport. Our goal, and by ‘our goal’, I mean a shared focus with Justin and Eric, is to bring a new level of stability and support to IAME dealers and customers in North America. Personally, I’m also focused on bringing a new level of support to the racers, the shops and the teams that are interconnected with Superkarts! USA. EKN: Tom, while on paper IAME USA West is a separate company, we expect that it will be very connected to Superkarts! USA. That said, over the past five years, you’ve been taking steps to assume more direct control over the different technical aspects of your organization. You’ve spec’d your tire program with private-labeled MG-SK tires, you’ve spec’d the oil and fuel used by your racers, and you now have the spec SKUSA exhaust pipe for the Stock Honda rulebook. Your newest move is to position yourself as the western distribution company for IAME USA, which obviously makes the statement for the future of SKUSA. Before we address that, we’d like to start by asking how this new opportunity arose, and then we’ll ask about the motivation to take this step. TK: The opportunity to get into this area of the industry happened when the IAME brass asked me for my thoughts on what was happening in the US. I gave them a frank opinion of how the TaG program was flawed, detailed some of the issues that I was going through trying to equalize the engines, such as the debacle at the SpringNationals last year when the Rotax became a necessary component for victory. Over the past couple of years, I’ve been vocal with my desire to move to a single engine formula for my TaG classes, and we’ve shown that with the Mini Rok in TaG Cadet and the IAME Leopard in TaG Junior. My critique of the IAME program in the USA was, not surprisingly, followed up with a ‘what would you do to make it better’. My concepts obviously fueled the interest in going down the road to what is happening now. EKN: What made you interested in getting into this level of management of the technical side of your business and the sport? I expect that you’re seeing the positive contributions of the spec tire program etc, in terms of SKUSA’s stability. TK: I’ve had the unique opportunity in my racing career to play a significant role in all three areas of the sport. I was a nationally-ranked Masters Shifter driver in the late 90s and ‘00s, I owned Extreme Karting in Anaheim, CA, where we were a top MBA, CRG and long-time GP dealer and won the SKI Team of the Year, and now I’m the owner of a karting organization that promotes the biggest national series in the country and the largest karting event in the world – the SuperNationals. I’m not saying this to impress anyone, but to simply state that I feel that I have a good understanding of the needs and desires of each level. I use this experience and knowledge on a daily basis when running Superkarts! USA. I want to make sure we make the right decisions for our racers, as well as the shops and teams that support SKUSA and make a living through our events. I also need to make the right moves for SKUSA, so that our company will stay profitable and that we can continue to grow. Our tire program plays two roles. 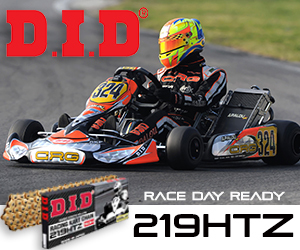 It provides our racers with a great product at a controlled price. They don’t need to test multiple tires or compounds to compete with us. They know they’ll be running the MG-SK White and that it’s a fixed cost. It’s great for our dealers as well, as the margins are good and they can stock tires knowing that they’ll get purchased. We move product steadily and our stock never gets old. We always have a new container on the ocean from Brazil ready to back-up the depletion of our current stock, and we pull from one end of the warehouse and re-stock from the other, so the tires are always fresh. Our tire program is also a key component to the financial stability of SKUSA, which is so important. SKUSA needs to be financially strong to fuel growth. If you’re a SKUSA racer or a shop that supports our programs, you want SKUSA to be strong financially. It allows us to grow and improve. Our fuel and oil programs are just spec’d, that’s it. We don’t make much money from those programs. We’re simply happy to provide products that our racers want to use. The new pipe for the Stock Honda program was different, as we needed stability in that area. I wanted to control the availability, lock in the spec, and at the same time improve the reliability, bring in a warranty against manufacturing issues, and lower the price. I’m thrilled that we did all of these with the new spec SKUSA pipe from Pro Circuit, such a trusted name in motocross. EKN: There’s no doubt that these moves have strengthened the SKUSA program and have brought stability to your company. The move to become one of the distributors for IAME products follows this theme, but it’s a huge advance in terms of business and bringing you even more control of your own destiny. Was simply bringing an end to the multi-engine TaG program a big part of the concept? TK: When it comes to our class structure and our rulebook, the biggest area of concern that we have is the TaG program. It’s caused us a lot of problems over the past few years, last year in particular. I think we’ve done a great job equalizing the Leopard and the Rok TT, but we had to deal with the tuning advancements of the Rotax last year, to the point where it really made a mess of the SpringNationals in Tucson. The Rotax was quicker, people started bolting them on throughout the paddock, and this put the spotlight on a glaring error in our engine declaration process. What it really did was fast-forward my thoughts of moving from TaG to a one-motor program. It’s common knowledge that the TAG program is flawed. We all know it. It wasn’t our idea…we just got stuck with it. Tom Argy introduced it back in the early 2000s to give all the Italian engine manufacturing companies a category to place their different engines into the US, and we’ve been working our asses off for years trying to equalize them. Personally, I think we’ve done a pretty damn good job developing a level playing field. Still, the idea of a one-engine program is very attractive and it eliminates so much of the BS. At last year’s SpringNats, I knew I needed to start moving in that direction. And once I knew that was happening, I spoke with all of the primary manufacturers. Each had their positives and negatives. The IAME engine program was the most attractive, and the eventual addition of the distribution package was simply a bonus. I jumped at this chance to connect with IAME because my motivation is clear. I want to solidify the engine programs that we embrace with SKUSA, so that my customers will have confidence in our program, and confidence in the fact that we’re focused on keeping the costs down. In becoming a new importer and distributor for IAME, one of my primary demands was to lock in the specs for the X-30. EKN: You’ve begun trimming the available engines for your TaG Senior and TaG Master classes, down to just the IAME Leopard, Rok TT and Motori 7, the latter of which will be eliminated in 2015. With this new connection to IAME, it doesn’t take a rocket scientist to predict that SKUSA will be all IAME in the TaG program near future. Is this the plan? TK: Yes, we’re going to move towards an IAME only program for TaG over the next three years, although the final calendar of class structure evolution isn’t finalized. And, of course, Honda will remain the foundation for our shifter categories. For this year, we’ve added the X30 to the TaG Senior and Master classes, but with a weight penalty that will keep it from being a competitive powerplant. My concept is to make sure that racers won’t NEED to buy an X30 to be competitive. We’d rather see people move to the X30 when the time is right for them. We’ll start equalizing the X30 to the Leopard in 2015. We’ve locked in the X30 specs for an extended period, because it will be our spec engine by 2016, I suspect. In 2015, we’ll have the Leopard, and the X30 (at a competitive weight). In the end, by 2016, it will be X30 only. We know that IAME is getting ready to cease manufacturing of the complete Leopard engine, so it will need to be removed from the Senior classes of the program sooner or later. We’re the only country that still runs this engine on the national level. IAME will continue to make parts for the engine to support its extended life, so we still see it playing a role in some fashion. They’re doing great things with a restricted version of the engine in Australia, so we’ll look at that option for sure. As for the TaG Junior class, we’ll stick with the Leopard for the next couple of years, and the Mini Rok will remain the spec engine for TaG Cadet. We’ve done a great job building that program with Vortex and we want to continue its growth. The idea of changing the TaG Cadet to an IAME product is not even on the radar. The overall concept is to move to a single engine to eliminate the confusion and hassle of the multi-engine format. EKN: There are obviously lots of questions being asked about IAME USA and how you will do business, and how this will affect Superkarts! USA. TK: I want to make this very clear. Superkarts! USA and IAME USA West may be owned by the same guy, but they are totally separate entities with separate warehouses and accounting books. Our focus with IAME USA will be to elevate the level of service for both dealers and racers. We want to open new dealers and provide them with healthy margins and a new level of support. There will be easy online ordering, to make being an IAME dealer an attractive part of any kart shop business. I want everyone to understand this. This will be a dealer-only program. I went through this when I had my own shop, getting beat on price by the importer who sold me my products at a ‘dealer discount’. IAME USA won’t be selling to consumers. We here to support our dealers, not compete against them. We’ve excited to work with existing IAME dealers and look forward to interacting with them to improve the overall dealer-distributor connection. We’re obviously interested in talking to new potential dealers as well, as one of our primary goals is to grow the network and the brand. We’ll have an IAME USA trackside service vehicle at all major events, like the SKUSA Pro Tour, the ProKart Challenge events and the LAKC for example. We’ll have competent techs to support the customers, and our dealers will be able to come up to the truck during a race weekend, obtain stock to support and sell to their customers, and they’ll pay us the following week. We’ll stock the product for the track and they’ll make the profit. It’s all about supporting our dealers and taking care of the customers. In addition, to support and protect our dealers, all new motors will have a new US passport program to ensure that they were purchased through our dealer network. Existing engines will also be brought into the program and given a passport, as well. EKN: Tom, if you wanted to get a message out the karting community in regards to the IAME USA West program, and the move to IAME engines as the spec for Superkarts! USA, what would it be? TK: The two primary reasons why we’re making these moves are…1) I want to solidify our TaG engine program so it’s the best possible for our racers and teams, and 2) I want to be in charge of my own destiny. Over the years, we’ve seen motors changing, top-end changing, bottom end changes,….and we’ve just taken it. We’ve had no choice. When the Italian manufacturers make a change to the spec, we have no choice but to adopt the new engine design and regulations. That’s why I’m super excited with the seven-year freeze on the X30 specs. It’s great for the racer and its great for the shop. As a racer, with this X30 program, you’re going to know that your engine will be legal and competitive for the next seven years. That’s big. And here’s the bottom line, if people are unhappy with the things that are happening, and they don’t know the facts, just give me a call. I’d be happy to discuss it with them. I’ll be at the SpringNationals in Dallas, as will Eric Jones, so feel free to come to me to get any of your questions answered. We expect to be up and running at 100% by mid-May, so any interested shop owners should approach me in Dallas. EKN: Tom, it sounds like you’ve made a solid move for both yourself and Superkarts! USA. Good luck in this new venture. TK: Thanks for the opportunity to get these facts out to the karting community. It’s always important to shut down all the rumors. It’s much appreciated. If people want the facts, all they need to do it call me.